The world’s finest in chic, natural luxury for home, body and face comes directly to you from the hillsides of the world’s capital of luxury—Provence, France. Dedicated to preserving and celebrating the traditions of Provence in the form of the beautiful, holistic, health-inspiring products, L’Occitane was created to bring life, luxury and love to the world and has been carrying on the tradition for generations. Redeem your L'Occitane discount code to start saving there today! In 1976 the 23-year-old Olivier Baussan began developing a steam distillation process to derive an essential oil from the plants most essential to life in Provence—Rosemary and Lavender. After selling the oils at the open air markets in Provence, Baussan developed a company based on these essential oils and named it for the women of Occitania who existed during the middle ages across southern France, North-Eastern Spain and Northern Italy. By 1978, the new empire of L’Occitane began to spread across France with a boutique in 1978 in Volx and the purchase of a soap factory in Manosque. By 1990, the inimitable Baussan had sold the majority of his shares in L’Occitane to fund the expansion of the new company. Today, L’Occitane has shops in more than 90 countries across the world with preparations being made for 650 new stores and the expansion of the online shop. Start your search for the perfect products for face, beauty or home with a quick trip to L’Occitane online. Begin browsing by product, collection or style until you find exactly what you’re looking for at the L’Occitane online shop. When you see something you like, click on the item in question and read a detailed description to see if this is really how you want to use your L’Occitane promo code. Review your order and when you’re sure you have everything you want to save on with your L’Occitane discount code, get ready to start the saving. When you see your L’Occitane discount code, click “Continue to Checkout” and get ready for the best part of the order processing—picking the free samples for you. When you’re all sampled up, click “Continue to Checkout” to save with your L’Occitane promo code. If you’ve shopped L’Occitane before, log into your account now or just add an email address and click “Register Now” to move on to the payment process. Add your delivery details and then create a login before you continue to the last stage of checkout and make your payment. Bring the beauty of L’Occitane to life with a quick trip to the L’Occitane YouTube channel. 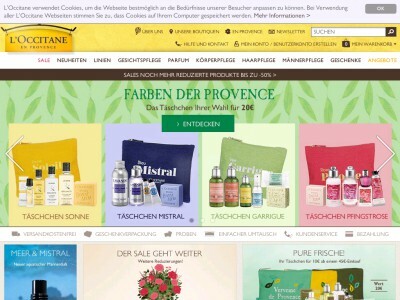 Start your search for the very best in beauty at the L’Occitane online shop. When see something that strikes your fancy, click on the image and read up on all the holistic details to see if this is the best way to redeem your L’Occitane promo code. Double check your order and when you’re sure that you’ve collected everything you want to save on with your L’Occitane discount code, prepare for the checkout process. When you’ve redeemed your L’Occitane discount code, click “Continue to Checkout” and enjoy picking out those incredible free samples. All that’s left before you finish up is to enter your delivery details and then create a new username and password before you make your payment and finish up. Standard Delivery is available for £3.95 within 2 to 5 working days, or completely free of charge if you spend more than £59. Next Day Delivery is available for £5.95 as long as you place your order before 2pm. Evening Next day Delivery is available for £5.95 for Residents inside M25 only. Saturday Delivery is available for £6.95. Click and Collect is available for £3.95 within 2 to 3 working days. Parcel up the unwanted, unopened products in salable condition within 28 days of receiving your order. Send your parcel with a copy of your invoice to L’Occitane returns department in London. Once your parcel has been received by L’Occitane, you’ll receive your refund directly. Don’t forget to check them often, as you can never be sure when a free L'Occitane Discount code might be waiting for you! Buy now online at www.uk.loccitane.com. Taking care of our bodies and our skin is something we can never start doing early enough, which is why shops like uk.loccitane.com are so popular. Not only can you get the best of face, skin, and beauty products, but you can also use an L’Occitane discount code or an L’Occitane voucher to greatly reduce the price of your order. An L’Occitane promotion code costs nothing to use and can be redeemed in seconds, so why haven’t you used yours? Stop by to pick up your L’Occitane discount code today!